Yesterday, the smallest female chick stretched her wings and took a jump off the building. Kudos to the folks at the Bronson Athletic Club on Farmer’s Alley for their fast response when the chick hit the window and then sat in the planter and looked in at the gym patrons on stationary bikes. The chick was not hurt and was promptly scooped up. Because she was not injured, the Department of Natural Resources advised that she be returned to the nest area to reunite with her family. Although her patience had worn a bit thin, she was safely returned to the parapet and joined her siblings for a meal. So, many thanks to the folks at the gym for calling and entertaining her with human gym activity while I ran for a box. 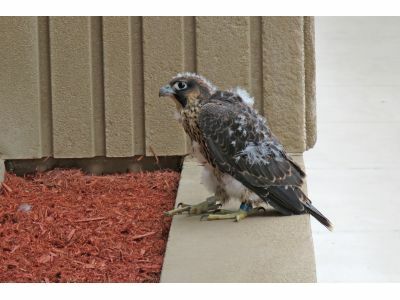 It is easy to become attached to these birds while watching the falcon family on line or on site. We get an intimate and privileged view into their lives and can celebrate great highs and milestones. But, unfortunately life is not always like a Disney movie and there are heart breaking lows that we also get to witness. So, it is with a heavy heart today that I report the male chick, the youngest, smallest, and least developed, left the ledge for his own adventure that did not end well. Even being present on site could not prevent the tragedy of his flight into traffic and his death. It is gut wrenching to watch his three sisters still up on the ledge and hope that they all successfully fledge and have safe landings as they learn the skill of flying.